Despite initial concern regarding the casting of Tom Cruise to play author Lee Child’s popular character Jack Reacher, described in the book series as having a larger physique than Cruise’s 5’7” appearance, the 2012 adaptation of Child’s book One Shot – simply retitled Jack Reacher for the big screen – managed to satisfy most critics and audiences by being a fairly entertaining action-thriller with the kind of sly wit and sophistication that writer-director Christopher McQuarrie could make work. McQuarrie, however, isn’t back to direct nor write the theatrical follow-up, based on the book Never Go Back, and honestly, it really shows. Jack Reacher: Never Go Back sadly lacks the quick-wit and somewhat oddball charm of its predecessor, and although replacement director Edward Zwick – who previously worked with Cruise on The Last Samurai – tries to keep the momentum going with intense fight choreography and several scenes of Cruise’s Reacher running or beating up people, not even he can save a script that ultimately succumbs to familiar clichés time and time again, so much so that you’re actually annoyed that a film like this is still doing these tropes today, at a time where we’re all desperate for some kind of change. In this film, Cruise’s Reacher returns to his former military base to meet with Major Susan Turner (Cobie Smulders), whom he has developed a slight rapport with over the phone after aiding the military police with several arrests over the country. However, upon arrival, he finds that Susan has been relieved of her command and placed under arrest over accusations of espionage, and shortly after Reacher himself is accused of a crime he clearly did not commit. Upon breaking himself and Susan out of custody, both of them go on the run to uncover the larger conspiracy that is keeping them buckled down by the law. On top of that, Reacher learns that he may be the father of a teenage girl (Danika Yarosh), who ends up accompanying them on their mission, despite the incessant danger from a rogue assassin (Patrick Heusinger) that’s hell-bent on taking down our heroes. Yes, it’s THAT kind of movie, the kind where a mysterious central figure finds himself in the middle of a high-up conspiracy that forces both him and other accused parties on the run from the law while they try to figure out who’s responsible for their predicament, as well as there being a clueless teenager in their custody as well. From that, you can easily guess how this is all going to play out, and unfortunately the film plays it completely straight and not with a lot of laughs to keep even such a tired plot as this afloat. Because it is all rather painfully formulaic, you know each and every plot twist or surprise that is coming your way, and find yourself counting down the seconds until said cliché makes its appearance on-screen rather than actually being invested in the story you’ve seen a million times over. A film like this needed someone like McQuarrie to be in charge of, because even though the plot in Jack Reacher wasn’t particularly ground-breaking or new, at least it was given an enjoyable sense of life that made if far more entertaining than it had any right to be; Zwick just doesn’t have the same amount of energy here, and it’s a serious problem when what it’s meant to be carrying is already rather rickety. Even Cruise, usually a charismatic actor in almost anything he’s in, just doesn’t seem to have his heart in it as much as he did last time, as he’s given nothing to really do other than to take out the bad guys and act menacingly while he does it, as is the usual Cruise way. His own sub-plot with potentially being a father is also a flat attempt at gaining some empathy for the character, because it not only makes him seem like a radically different character than he was last time, but the teenager herself is an infuriatingly obnoxious and sometimes pretty dumb character that anyone in their right mind would hand over to protective custody than keep around them for one second longer. 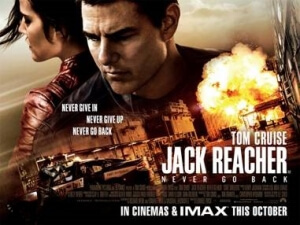 It’s unlikely there’ll be another Jack Reacher film after this one if audiences react the same way as critics are at the moment, and if that’s the case then it’ll be a shame, because it’d be nice to see McQuarrie maybe do another one of these films to try and show the world there’s more to this character than just beating people up. However, Zwick may have gone a little too safe for the film’s own good, turning in something that is infuriatingly formulaic and clichéd that it overshadows the enjoyment we’re meant to be having with this film. Jack Reacher: Never Go Back suffers from an infuriatingly formulaic script with way too many predictable clichés for it to even be remotely entertaining, with even Tom Cruise unable to bring his own charm to level things out, and making us pine for writer-director Christopher McQuarrie to come back after his absence here.